Do you want to make your hiking boots last? Of course you do! Throughout the years I’ve had to throw out hiking boots just because I couldn’t stand bringing them into my house. Otherwise, high-quality boots that just plain stunk. Hiking boots aren’t cheap so I buckled down and found a way to get rid of that stink. With a little bit of elbow grease you can completely get rid of that funky feet smell for good. Can You Actually Fix Smelly Hiking Boots? Throughout the years I’ve tried just about everything to make my boots smell good. It all started when my college ex-girlfriend forced me to throw out a pair of nasty smelling boots. Obviously I was pissed, but she had a point. Nobody wants to smell foot sweat from across the room. So before she found my stinky lifting shoes it was time to figure out how to get rid of that stink. When done right you can completely eliminate that stinky feet smell in your hiking boots. It’s going to require completely washing out your boots and getting rid of years of sweat. Here’s how I clean my hiking boots. Obviously, the short answer: sweat! Your entire body sweats, but each foot contains over 250,000 sweat glands. That’s close to a quarter of the total sweat glands found in the rest of your body. Your feet are going to sweat, there’s no preventing that. This is going to cause bacteria(very smelly bacteria) and fungal buildup. Bacteria lives on your feet, in your shoes and that hot/humid environment doesn’t help matters. To stop that smell, you need to figure out a way to eliminate bacteria and moisture. After a long days hike there’s going to be sweat in your boots. You can buy the best moisture wicking socks and do everything right, there’s no way to fully prevent sweat. Go into your local shoe store and you’ll likely see dozens of different anti-smell products. Some of those work to get rid of bacteria, while others simply mask the smell. You can break these products down into two main categories. 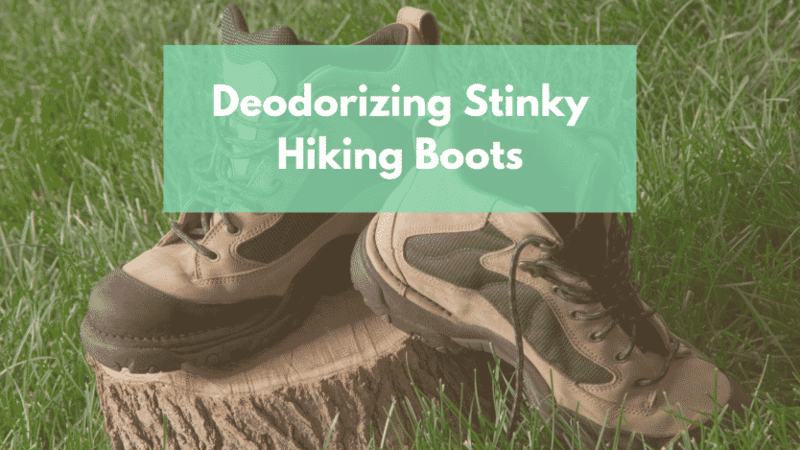 Deodorizers: Products marketed as deodorizers simply mask the smell of your boots. Most of these products are simply sprays that mask the odor. You’ll end up with a combination of fragrance and smelly feet(not my cup of tea). Odor Eliminators: Odor Eliminators all use the same basic concept to eliminate smell. They use a porous material like baking soda or charcoal to absorb moisture and bacteria. Check out these Arm & Hammer deodorizing balls. They are literally plastic balls filled with baking soda. By far the best cure for smelly boots is to sprinkle in a couple teaspoons of baking soda and letting your shoes sit overnight. After 24 hours you can remove all the baking soda by vacuuming it all out. Check the smell of your boots and if they smell decent it’s time to buy some deodorizing balls. (These are the balls that I use) If they still stink repeat the process leaving the baking soda in a little bit longer. If you’ve tried the baking soda and that didn’t work you have a few other options. You can either buy a commercial bacteria killing spray (like Sof Sole Fresh Fogger), or make your own using a vinegar mixture. Honestly, commercial sprays aren’t that expensive so they’re worth a try, but there is a DIY solution. Mix a solution of Equal Parts Water and Vinegar. A little bit of this solution goes a long way. FYI Vinegar sprays can be used to destroy bacteria on your carpet, bed, car ETC. Pour the spray into your water bottle and make sure everything is well mixed. Spray the vinegar based solution into your boots and let your shoes sit overnight. Try not to get the solution on the outside of your shoes, because it can cause slight discoloration. After you’ve killed the bacteria and fungus, how do you prevent the smell from returning? Prevent further bacteria buildup by eliminating moisture. Keep Your Feet Clean: Keeping your feet clean is easier said than done out on the trail(obviously wash your feet daily if possible). You probably won’t be able to wash your feet everyday on long backpacking trips. Do your best and try to replace your hiking socks frequently (check out my post on choosing hiking socks). Moisture Wicking Socks: Not all hiking socks are designed to wick away moisture. I love the Darn Tough Ultralight Hiking Socks during the heat of summer. Cycle Your Boots: I get that you aren’t going to be able to switch boots on a multi-day trip, but you should be able to rotate shoes between day hikes. Try to let your shoes sit for 24 hours between hikes and it wouldn’t hurt to toss in a deodorizing ball. Try Masking The Smell: Masking the smell is a great short term solution if you don’t have the time to completely eliminate bacteria. This isn’t a permanent solution to your problems so treat your shoes with baking soda later.